We arrived in Holland on a Sunday at sunset. It had just rained for a little bit so the meadows were wet and the birds were singing their song. 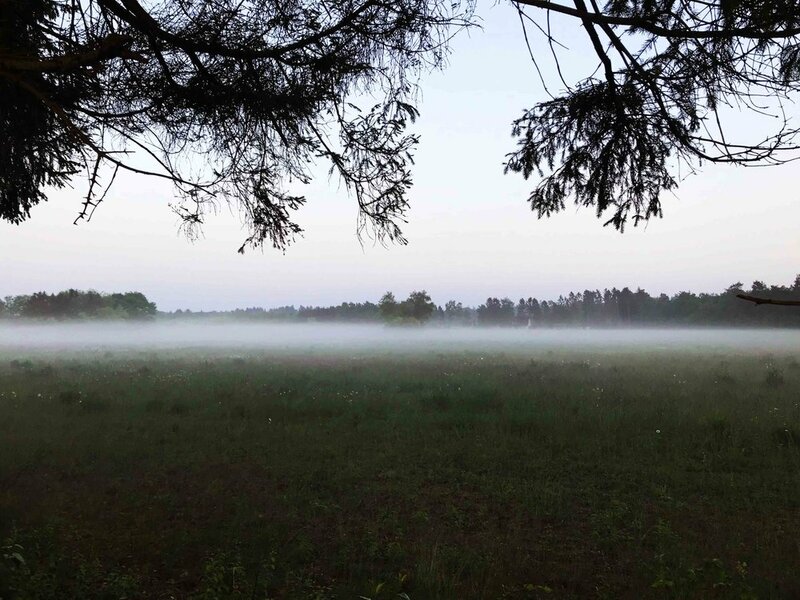 A soft and milky blanket of low mist covered the roads and the fields, and the smell was so invigorating. Hardly a car on the road. 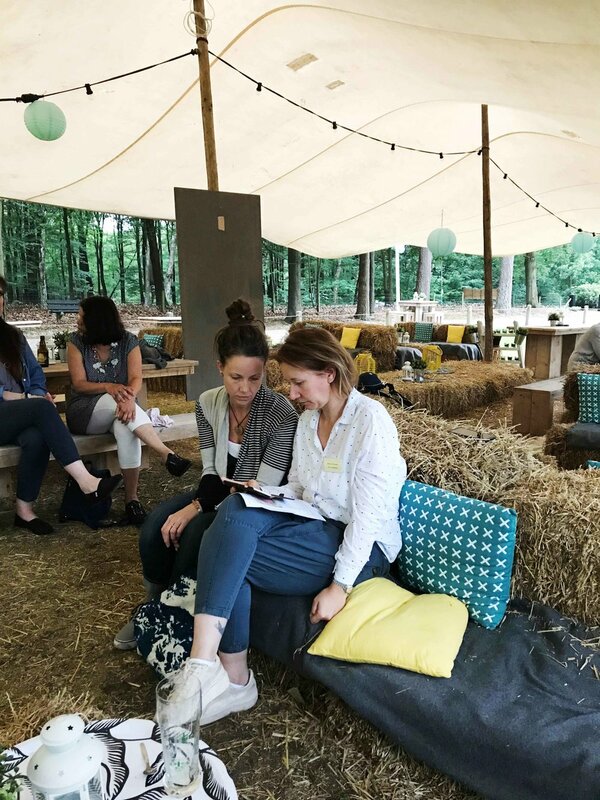 The Holland experience, retelling the events that took place during the European Waldorf doll seminar 2018. We started driving from Dunkirk, all the way up through Antwerp and landed in a campground close to Emst. I will be writing a more detailed account of the entire trip on a future post (since so many of you have asked for tips and info regarding a trip such as this one) but this post pertains mostly to our arrival in Holland and the events that took place in Elspeet, for the European Waldorf doll seminar. 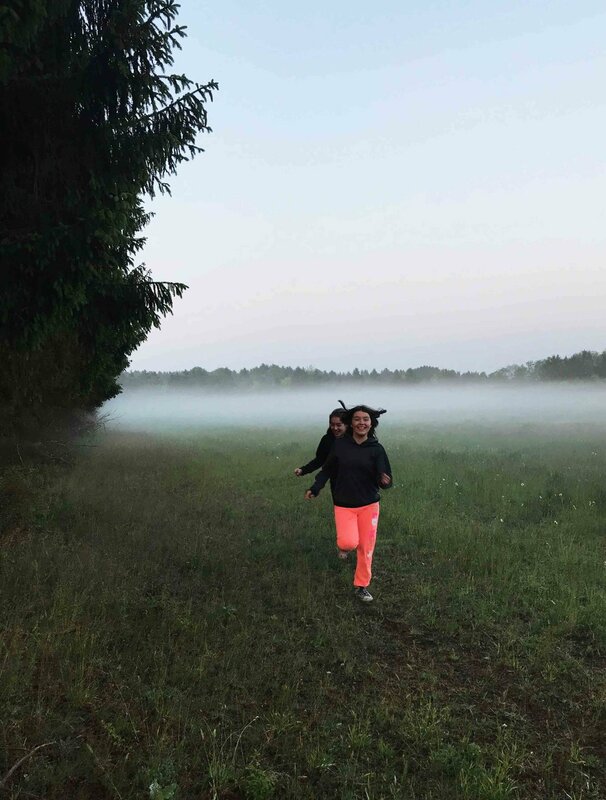 My girls running through the misty meadows. Upon arrival we met with the event's organizers on a nearby city, Berend and Kamrin teKronnie [www.waldorfdollsupplies.com], to receive a few dollmaking supplies as well as some packages we had sent to their home address. We were all very excited and ready for the event to take place the following weekend. I wasn’t sure what to expect, though by teaching a previous workshop I thought I had some idea. I was wrong. The blooming rhododendrons of Holland. The first event took place on May 25th through 27th at the Hotel Mennorode. 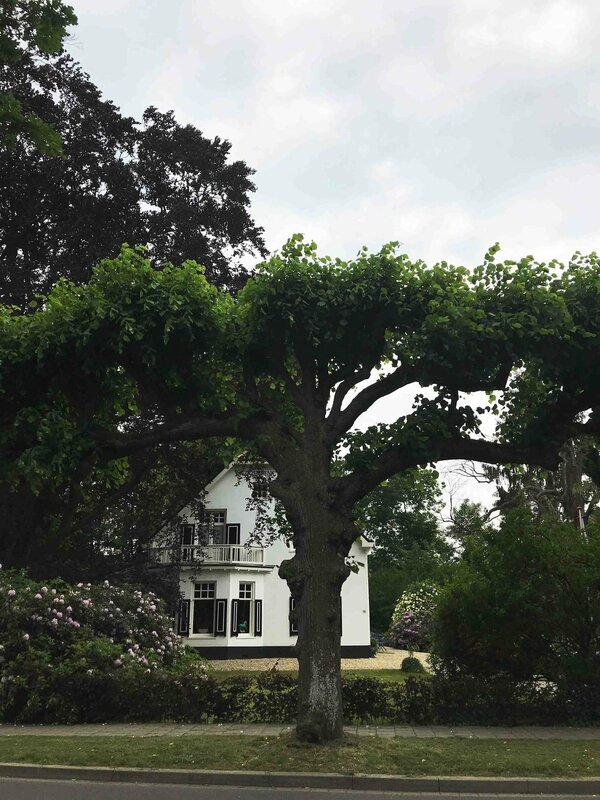 The hotel is situated in a beautiful area of The Netherlands, an ancient forest (of the few that are left) surrounded by agricultural land, thatched farmhouses and very small villages. It truly is like being in a fairy tale. These villages are a few blocks deep and that's that. But they are all extremely accessible, the roads are extremely well kept, and everywhere, absolutely everywhere you go there are extremely well-kept bike lanes. That is one of the most striking things about Holland. Everyone rides their bikes. There are long bike racks by each bus stop, as people bike there and then take the bus to a larger town or even city. Old ladies with their grocery shopping, young moms with three kids and all their things, a Dad going to work in his fancy suit, Grandma picking up flowers, kids as young as 7 or 8 go home on their bikes. No fear. When you come from the north part of a continent where you are bombarded daily about child safety, it felt very refreshing to see the children so free to move around by themselves here. No one calls the police if they see a 7 or 8-year-old on their bike in the town. It is perfectly fine. People are so mobile on their bikes that it was really nice to see so many elderly people riding their bikes all over the place. The most massive espalier-tree I ever saw. Epe, Holland. My family exploring the magical area around Vierhouten and Emst. Holland 2018. Back to Mennorode, the hotel is very beautiful, with large meeting rooms and a very nice, calm atmosphere. The seminar was distributed to take place in a few of the buildings of the hotel, and on Thursday afternoon I went to see my future classroom. I brought my supplies and made sure everything was right for the class to start early the following day. I received my tutor badge from Kamrin and went to check out the room. A little note shared on Instagram. I had requested from the very beginning to have a private room. My class was of 6 people, so rather small compared to the other courses, but I still wanted to give them privacy and quiet to know each other and to really dive into the doll making experience in a peaceful atmosphere. This room had a blue carpet, which I considered a lucky sign since blue is my favourite colour (I know, I’m like a 6-years-old). One of the walls was entirely made of windows, overlooking the garden and the forest, with some pretty amazing rhododendrons blooming fiercely. I moved tables around, met a few friends and went back to the campground for the night. My heart beating so fast. I couldn’t believe what was about to take place, a whole weekend surrounded by doll makers (I had only ever met one in my entire life), students, wool, and dolls. It almost felt unreal. The scenery helped to make it even more otherworldly. Friday morning, I had a shower with shaky knees, I was so nervous. I had bought flowers for my students and had charged all the batteries for the fancy camera. I brought my laptop in case I could do a Facebook live from the classroom for all my friends back home who couldn’t come. Little did I know that I would barely manage to turn the wretched thing on for a few minutes, as I would be so absorbed teaching and meeting and chatting and smiling. The Doll Making workshop, by Fig and Me. Natural fiber art dolls. This was the classroom for the second weekend. Derek brought me to the hotel very early, a short 12 minute drive. He helped me set up all my supplies: their doll making manuals, felting tools, wool wand, etc. I was ready for them. It took a little while to find them all as the hotel is very big and I had to keep searching for them. Good thing everyone was wearing a badge, though I knew some of their faces already from social media. The event started with a short talk by Kamrin’s mother, a couple laughs when she realized she was talking in Dutch and quickly corrected, welcoming everybody very warmly and wishing us all good luck, so away we went. You could feel the excitement and happiness as people kept hugging each other, recognizing each other, and trying to find their workshop table or their classroom. I took my students back with me and we started. Beautiful Francine, sewing patiently her doll. 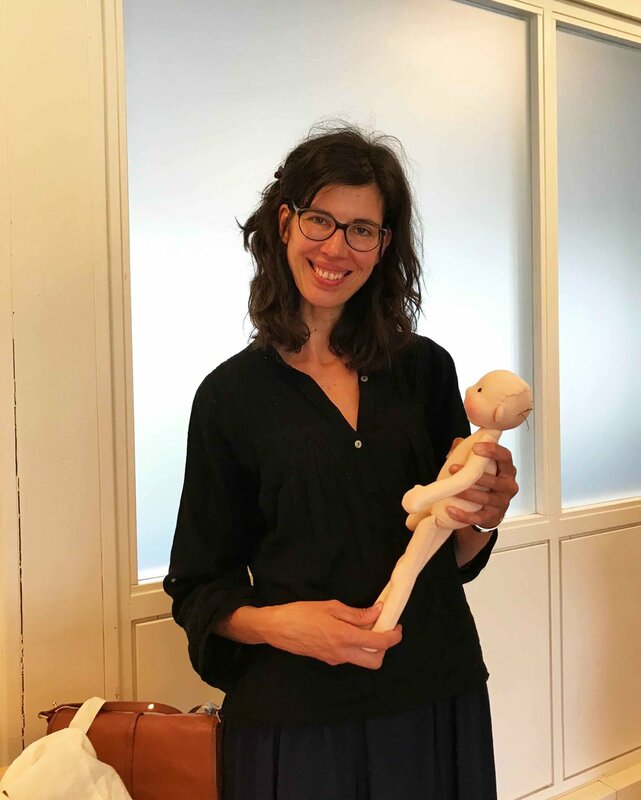 European Waldorf Doll Seminar 2018, Fig and Me Workshop. Jitka making sure her doll sits properly. European Waldorf Doll Seminar, Fig and Me Workshop. Jacqueline [Poppelien] making steady and beautiful stitches on her doll. European Waldorf Doll Seminar, Fig and Me workshop. Over the next three days I shared so much with them: laughs, pricked fingers, life stories; I answered their questions, they answered mine. I wanted to know how they found out about the event. All of my students had found out through my newsletter, so I thought “what a good thing I keep sending that thing!”. I taught three workshops: the doll workshop, the stuffing workshop, and the needle-felting workshop. Each class was full to the brim, and in some cases, I had to make exceptions and take more students due to special circumstances (mainly husbands pleading on behalf of their wives for a spot in the classroom, all as surprises to their wives, how could I refuse?). Needle-felting a doll's face, Fig and Me workshop. European Waldorf Doll Seminar. I probably should have only taught one workshop though. But since the seminar was about refining doll making skills I wanted to be able to offer more chances for people to learn just one technique, like wool rolling or needle-felting. Truth be told, the majority of my doll workshop students sat by my side and finished their dolls next to me, so if they had any questions I was able to help them throughout the entire weekend. The Good about this? I got to meet many, many students. I got to share with more people my love for doll making, more people than if I just had taught one doll workshop. The Bad? the doll workshop schedule in particular wasn’t sufficient to finish the doll. But I supplied the students with a PDF file more than a hundred pages long (including the pattern) so that they could finish at home, at their leisure. Making a Natural Fiber Art doll, Fig and Me Workshop. European Waldorf Doll Seminar. I got to meet so many of my colleagues and friends, tutors at the seminar as well. The list is quite long and words will never be enough to tell you what it feels for me to have finally hugged these people, to have heard their voices, held their hands and have seen their dolls “in the flesh”. I saw Agnes [www.lalinda.pl] as I entered the main room on Friday morning. She was talking to some of her students and I just stood behind her, waiting for her to notice me. She turned around and she gave me the biggest smile ever. Agnes and I go way back, before she even had a Facebook page (something I convinced her of doing a long time ago, now I am trying to convince her to open a newsletter too) for her business, back in the good ole’ days of nothing but Flickr. We have both have worked very hard and seen our little doll businesses bloom and our dollwork expand. I support all her adventures and can’t believe I was lucky enough to meet her. She was teaching a workshop on how to make a little baby doll, but let me tell you people: the minute details of this doll made my hands hurt just from looking at it. Work of angels. I made a mental note to say a prayer for her students that night. Agnes, from Lalinda, teaching a workshop during the European Waldorf Doll Seminar. Next, I went and poked Maria [Maria’s Nature Toys] from the back and introduced myself. We’ve also known of each other for years and years and it was great to see what a delicate creature she is. I stand my ground and swear she is part-time fairy. I actually stared at her several times as she walked through the room to make sure she wasn’t levitating. She is one of the most graceful human beings I have ever met. I had never had a conversation with Dorota [Mum&Dot] before this event, other than mutual admiration for our dolls through Facebook. But I did get to talk to her for a little bit, stolen moments between breaks, while setting up workspaces, sharing our fears of students leaving with half their work done, broken needles and exhaustion, and sharing our informative bits of children and camping life. 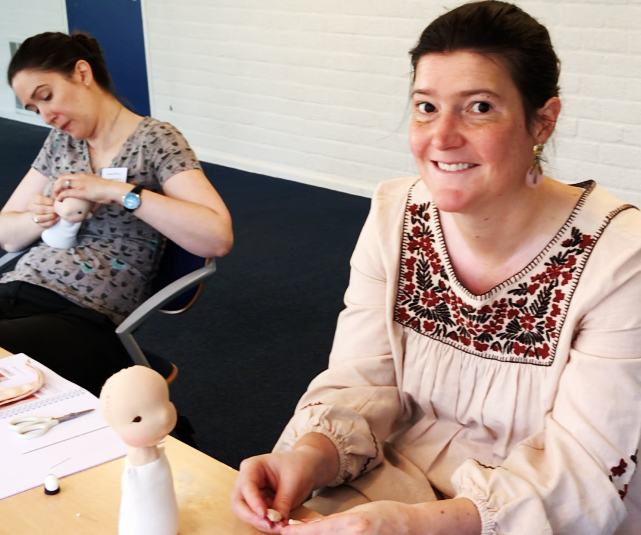 Fig and Me Doll Making workshop, European Waldorf Doll Seminar. I also met Maureen [poppenliefde.blogspot.com] that same day. She was in a total panic at the slow progress of her students, which gave me such a sigh of relief as I felt exactly on the same boat. I got to hold the little doll she was teaching and marvelled at the minute bunny boots she was wearing. How do these people do it? I can’t make such tiny things to save my life. We all agreed, Agnes, Dorota, Maureen and me, that trying to teach how to needle-felt a doll in such a short time was positively mental. Agnes had a quote for me, which I thought was pretty accurate: “We all know no one is going to finish, it’s not about finishing, it’s about learning. We all have to believe they will finish, but we all know it’s not going to happen”. I laughed for hours at this. But seriously, making a whole doll in 1,5 days (most of us had agreed to teach this crazy schedule, aside from teaching more workshops!) was a total gong-show. Never going to happen. Fabiola (Fig and Me) and Meglena (North Coast Dolls). Sisters in crime. Well, someone put us all in our right place. All of Meglena’s students [North Coast Dolls] finished their dolls in 2,5 days (she only taught one workshop) though it almost killed Meglena! Lord help us!. What would we do if she perishes whilst teaching a class? Do be kinder and gentler with yourself my dear, and I will follow your advice of never working in the evenings and weekends, I promise!. Agnes and I were very impressed at her fortitude and vowed to follow her lead of having life boundaries and not letting doll making rule your life. Easier said than done I swear. But I will try Meglena, I promised. One of the greatest surprises was meeting Daria [www.petitgosset.com]. While I didn’t manage to snap a photo of us together we had a few brief encounters. I have always been a huge fan of Daria’s work and consider her sewing techniques something for me to aspire to. She has such a classical approach and everything she creates is of such high quality, I felt in the presence of a true Doll Dressmaking master. The surprise came because I was expecting Daria to be very quiet, shy and almost godly. But she is one of the most down-to-earth dollmakers I have ever met. Such a frank smile and warm heart. I also met one of my idols, sweet Elena [www.atelier-lavendel.com] I admire her work so deeply as it comes from such a gentle and pristine place in her soul. Her dolls have always spoken to me very clearly and though classic in style, I can always recognize her hands immediately. Her dolls speak of childhood, family, doll play and adventure. I really cherish the moments I got to talk to her and to see her kind smile and playful eyes. I had very brief meetings with Ineke [poppenatelier-inekegray.blogspot.com] and Olga [Genuine Dolls], because honestly there just wasn’t enough time. Sadly I also had to miss the marvellous talk that Maike [feinslieb.net] gave regarding CE markings for the European market, though I did get to hang out with her a little more as she was in one of my workshops and she was a total riot!. You can find a little video from the first weekend here. 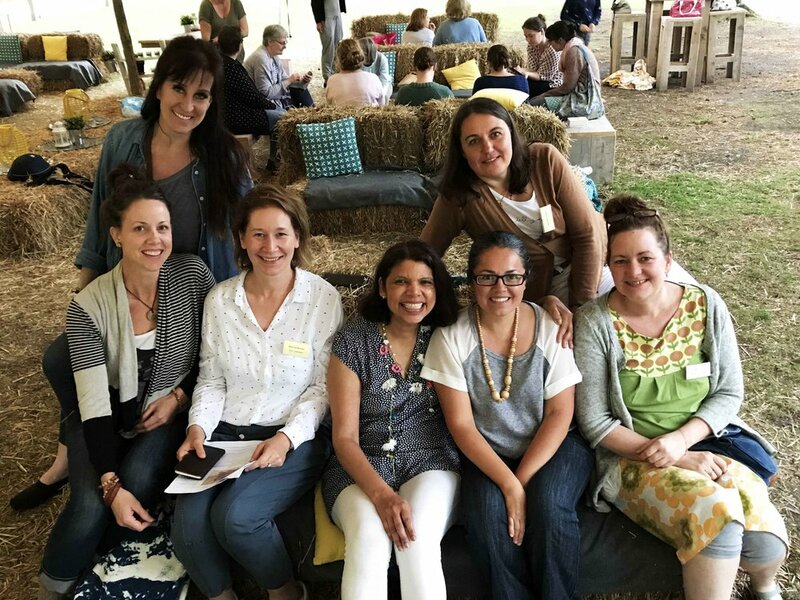 Some of these friends, both tutors and students, returned for the second weekend of the event, though a much smaller group and gathering it felt equally special. After the first weekend, I decided to change gears and I arrived at my first class with more work pre-done for my students in the hope that they got further along on their journey. That seemed to do just the trick. Since I also knew how fast-paced and a wee bit hectic the whole thing could be, I requested from the trip organizer (a.k.a Derek) to be allowed to stay Sunday afternoon after my last class so I could chat with most of my friends there. European Waldorf Doll Seminar: Top row: Reggies Dolls and Lalinda. Bottom Row: Soul Stitching Dolls, Poppenliefde, Kamrins Poppenatelier, Fig and Me and Bienchen & Blümchen. Both students and tutors talking, Lynne from Soul Stitching Dolls and Maureen from Poppenliefde, at the European Waldorf Doll Seminar 2018. Derek and I spent a lovely evening talking shop with Agnes, discussing trends with Maureen, hearing the crazy plans of Reggie who is out to rule doll world with her upcoming event [DollFolk Handwork Festival], hearing the nightmare stories of flying from Lynn, worshipping the stuffing technique of Sabine and just enjoying the slow come-down to reality after such an event. One of the craziest things was being “recognized” by people I have never met in real life. So many hands gravitated towards me with twinkling eyes, then they would come and tell me the most beautiful stories about themselves and how my work, my love letters, stitchy notes or my blog had impacted their lives so deeply. I felt incredibly grateful for these moments as they have truly cemented some notions regarding the way I have chosen to do things around here, both on the blog and through the newsletters and Patreon. I recognized many of their names once they introduced themselves, as we had corresponded previously. A few of my Patrons were there too and a few of my doll customers too, who by now had become very good friends. I even had the chance to teach Francine and hand-deliver her doll (who had been waiting so patiently with me for almost a year). Penny and a little doll in process, watching a determined doll maker at work. Fig and Me Doll workshop. Everyone was asking whether I could sell them a wool wand, to which I replied: of course! Derek himself got to help them choose the best one for their needs. It truly was a wonderful event. Spread out over two weekends and still not enough time. I am positively floored by the talent of some of my students (Sabine went home and hand-sewn an entire medieval outfit for her doll in one night and came and showed me the next morning. Almost peed my pants! ), who were kind enough to share some of their doll and handwork with me, and even tips with me. So if you were left behind I hope you can come next time. It will happen again in 2020. It is a gigantic endeavour to organize and that’s why it’s been held every two years. I can only hope this event gets better with time. Everybody so busy, learning to use the wool wand for super firm and smooth doll limbs. They all mastered the technique, such good students. Fig and Me doll workshop. I loved every second of it, though I would have loved for it to be longer. Three days is not enough time and if I come back again I am definitely teaching smaller workshops so that I can also sit back and chat with everybody too, instead of feeling bad for sending my students back to their rooms or homes with hours of homework ahead of them. Maybe even taking a couple courses myself, I so wanted to but the weekend was full of teaching. I also hope it is open to non-students as well. This time the only part that was open for the public was the textile market, but I truly feel that adding more talks, shorter workshops as well as the long workshops but spread over several days, and maybe an opening and closing night where others non-students can come and join would be a wonderful idea. It was so intense, the teaching especially, that every night I could barely talk, I had no energy to do much other than going home and sleep. Fostering community within those that love this style of dolls and doll making can only benefit the world. The best part of this event was not the workshops and the knowledge imparted by the tutors, it wasn’t the products available for sale or the techniques shared, it was the gathering of all of us there. It created a special atmosphere and a very high energy of playfulness and dolly happiness. Greatest thanks to Kamrin for inviting me, to Berend for helping me sort out everything that needed to happen, to my students for their utmost attention and the hours of their lives they bestowed on me (I had students from France, Russia, Chekoslovakia, Germany, Iceland, Belgium, Holland, Portugal and Norway), to my fellow tutors for the laughs and shared concerns, to every person that came and gave me a hug, told me they love my dolls or sent a smile my way. I am trying my best to imprint every minute of it and I can hardly believe it actually happened. Such a great atmosphere, to sit with others and create dolls. The world really is better for it. Fig and me doll workshop. All I can say it was pure magic. Can’t wait to be back!. May 24 The start of something truly magical. Feb 27 Explorations on Movement. Part 1. Apr 16 Spring fairies of 2018: Maedhbhina, Beileag and Annke, three art dolls ready to play. Dec 3 The Big Fig Doll Pattern, ready for your making hands.